The preferred cocktail mix of bartenders! Prepare these popular martinis perfectly in 3 easy steps! 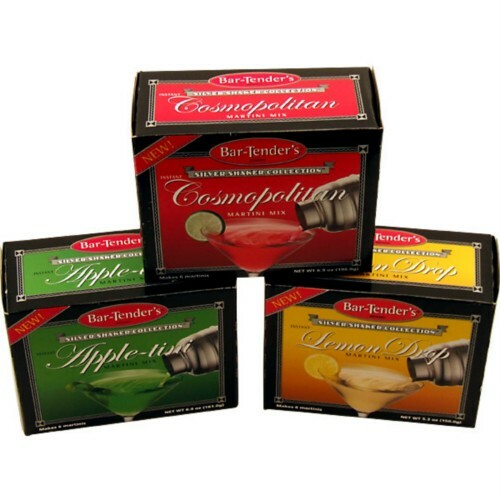 Assorted 3 pack contains 1 package of each martini mix! This lemon drop martini mix makes incredible cocktails, instantly and easily. All it takes is water, vodka and one of these bartender mix pouches. Simply combine the three ingredients in a cocktail shaker with ice and give it a few shakes. Strain into your favorite martini glass and garnish with a lemon slice for a delicious lemon cocktail that is sure to impress. 3 Packages - Each package contains 6 pouches. Each pouch makes 3.5 fl oz cocktail.